Deborah Fry (JD’80) was appointed Chief Justice of Newfoundland and labrador on June 22, 2018. On June 22, 2018, Deborah E. Fry (JD’80) was appointed as the first female Chief Justice of Newfoundland and Labrador. Born in Shellbrook, Sask., Fry moved with her family to Prince Albert, Sask., when she was about five-years old. To be exact, she moved in to the house right next to the former home of John Diefenbaker (LLB’19). One might assume this happenstance influenced Fry to be on a legal-minded career path from day one, but it was instead a career in nursing that intrigued her. She graduated with her Bachelor of Science in Nursing from the University of Saskatchewan in 1973 and then began working in pediatrics and as a public health nurse in Saskatoon. In 1974, Fry made the move to Australia and in 1975 began to teach at the Western Australian School of Nursing in Perth, but in the back of her mind, she was thinking about an even bigger move—a career that might give her a greater level of independence and autonomy, possibly even a higher income. “My father was a doctor, so medical school was what I was thinking about pursuing, so I enrolled in medical school in Australia,” explained Fry. After encountering difficulties transferring back to the University of Saskatchewan’s College of Medicine because of rules of residency (she would have to reside in the province for three years before they would consider her application), she instead began contemplating a career in law. “I started hearing about law and learning what lawyers did and I thought ‘that might meet my career goals of independence and autonomy,’ so I looked into it and applied,” she said. Throughout her accomplished and varied career, Fry has kept close ties to her medical and healthcare roots. Upon arriving in N.L., with her husband John Clarke, QC, (JD’79) she immediately connected with the nursing and medical community and lectured on medical-legal matters. She served as deputy minister for both the Department of Health and Department of Social Services. Once she became a judge of the Supreme Court in 2007, she joined the board of directors of the Judges Counselling Program. “I think my health background connected with my legal background has served me well in a number of positions, including those public policy and administrative positions,” said Fry. 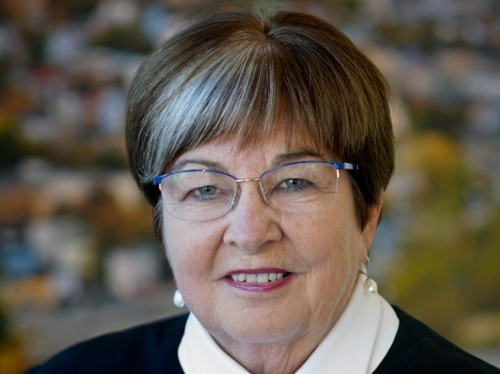 Besides the ground-breaking (or ceiling-breaking) accomplishment of becoming the first female Chief Justice of Canada’s most easterly province, Fry’s resumé also includes becoming the first female Clerk of the Executive Council and Secretary to Cabinet; co-founding the Centre for Innovative Dispute Resolution; serving in a number of senior leadership positions within government; receiving the YMCA/YWCA of St. John’s Women of Distinction Award and the Queen’s Golden Jubilee Medal; and being twice named one of Canada’s Top 100 Most Powerful Women by the Women’s Executive Network. She also lists her work on the elimination and reform of the denominational education system in N.L. as one of the highlights of her professional career. The change required a constitutional amendment and as the deputy minister of the Department of Education at the time, Fry spent a great deal of time in Ottawa at the House of Commons and Senate. As a result, Newfoundland and Labrador now has a single public school system where religious and spiritual values are still taught, but schools are not religiously-based nor does the church have a role in the governance or administration of the school system. As she transitions into her new role, Fry has a number of goals associated with the position. One of those being a continuation of her participation with women’s organizations. Fry also wants to make sure more people are aware of the impact women have made in the law and judiciary in her province. During her swearing-in ceremony, she gave attendees a quick history lesson on women in law in Newfoundland and Labrador. and named women who have fought for inclusion, freedom of choice, human rights, equality rights and more, as a continuing source of inspiration. And the importance of adding her name to that list of women is not lost on her. When it comes to some of the other challenges facing the court, Fry is looking to advance and move forward on some of the initiatives already underway, including reopening conversations with respect to models of judicially led court administration that feature a greater degree of judicial involvement in ensuring proper funding and staffing of courts while preserving judicial independence and public accountability for money spent. “Another issue that I’m working hard on is ensuring that the judgments of the court are released on a timely basis, living up to the Canadian Judicial Council’s recommendation of six months from hearing to release of decision,” she said. “Making the rules of court more understandable and adaptable for individuals who use the court system is also one of my goals,” said Fry, adding that the rise of self-represented litigants in courts and procedures makes this increasingly important. Since taking office she has already done significant work related to the provision of legal assistance for incarcerated self- represented litigants, including improving ways to distribute legal information and streamlining processes for connecting them to legal counsel or pro bono services. Through her past work as a public servant and in her current work at the Court of Appeal, she has maintained ties to the University of Saskatchewan through the fellow alumni who surround her. “We have a number of graduates here in N.L. including six judges sitting on the Court of Appeal, the Supreme Court and Provincial Court,” she observed. She also points to the college’s Nunavut Law Program and recently announced partnership with the Government of Newfoundland and Labrador in which the college plans to reserve two seats annually for Indigenous students from the province, as important connections. With a less than typical path to the highest court position in her own community, her advice to law students and new lawyers takes that into consideration.